I am desperate for travel, and also keenly aware that this is a terrible time to be traveling. My kiddo had a tonsillectomy last week. He should be fine by the time I leave -- 14-days post-surgery -- but I'm still nervous to leave if he isn't 100%. My dad is feeling the effects of his most recent immunotherapy, and I'm nervous to leave him. LUCKILY, he's decided to join us on this tour -- be customer #1 for Brigid's COACH BUS TOURS OF SCOTLAND where all my friends join me on a pub-tour. (Someone out there, please organize this because I have organized ENOUGH things for enough people this past month to last a lifetime.) I'm hoping he'll be able to take some photos too, so that we'll have more than just weird selfies and a bunch of pictures of a banjo. My little guy has fallen deeply in love with acting despite my best efforts to encourage the MBA instead. Are you in the UK? Will I see you on this tour? Message me if I won't. Just say hello. I have been a bad blogger because I've been spending 25+ hours a week on a volunteer job instead of my, like, career. Turns out that's bad business all 'round, both for the bills and the spotlight. Look for me to be back here more often. ALSO -- I HAVE A NEW SINGLE COMING OUT ON FRIDAY!!! WFPK is premiering the video on their website on Thursday, April 5, so you can be the first to check out the new song. Scotland, England, I am coming for you! It's not been a fabulous past year, which has clearly affected my mental health ... and therefore my writing frequency, which then circles back around and affects my mental health negatively. Losing your mom isn't something I would recommend, though it's been living with my dad. I don't post a lot of super-personal stuff (hard to believe, I know) on the internets, but my dad's got cancer too. His is a rare form of sinus cancer, and despite surgery, chemo and radiation, it's popped back above his eye. In true Kaelin spirit, however, he's decided to not let that stop him from doing, well, anything. In fact, he's bought himself a plane ticket and will be official videographer and merch person on my UK tour in four weeks! I typically don't allow my family to come on business trips with me, but this is a very different situation. Plus, my dad is a silent, stoic type, so I can't imagine him being anything but fun on this trip. It will also be fun to point the audience to a merch person with an eyepatch! Those of you who are reading this in the UK, please come say hello!! 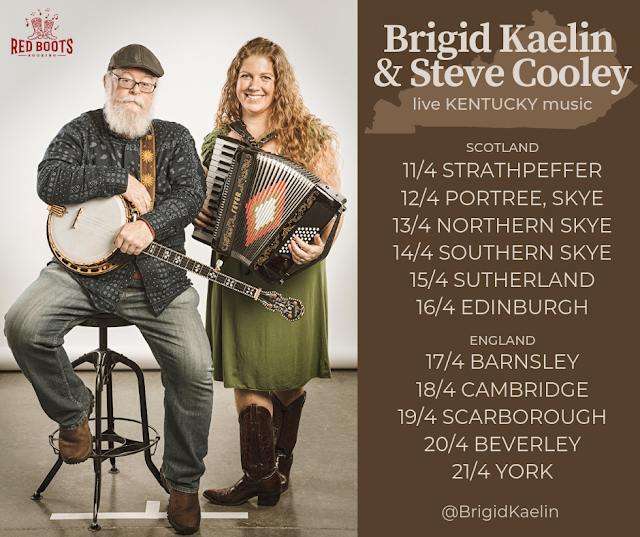 The shows in Strathpeffer, Southern Skye and Beverley are house concerts, so email me if you want details about that. The other shows are listed in more detail on our Facebook event tour. It would be FANTABULOUSLY helpful if you shared the Facebook events/graphics with your feed or tagged your friends who live in the UK. We all know that music is essentially free these days, so the best way you can support a musician is to TELL YOUR FRIENDS! Please help spread the word? I even made Steve sit down for a silly video to promote our new tour. It shows that our cinematography is very weak, but that we are generally fun people to be around. Come say hello, UK friends!! Buy us a drink or a meal or a tank of petrol, and we'll be sure to shout out to you on our tour vlog ... and review a particular whisky if you like, or dedicate a castle to you. Well, there’s a beautiful segment on me on KET that premiered this weekend, and there’s a sound byte about how when I don’t write, I don’t feel well in the head. Funny how I had to watch myself say it on TV before I realized maybe that’s why I’ve been feeling so bad lately. It’s been a month since I blogged! To be fair, it’s been a year, and we’re not even two months in yet. My dad’s cancer has had a recurrence, this time as a tumor in the sinus above his eye. Graham’s taken up acting (and booked a few gigs! ), our au pair went on vacation (she’s back, yay! ), and I’ve taken on a volunteer gig that turns out to be a full-time job, all the while trying to work my actual job, finish an album, promote my upcoming UK tour and sort out a summer Europe tour as well. I get that whole ADHD panic of I-don’t-even-know-where-to-begin and then somehow prioritize designing a graphic for a Facebook event cover of a show I’m not even singing on. FACE PALM. Anyway, in general, life is fine. We aren’t skipping meals. We can afford childcare. The wee boys are gorgeous and sweet and lucky and privileged as anyone could wish upon their children. My dad seems in good spirits, though we aren’t a family to talk about our feelings (that’s David’s job). I think we’ve given up on the idea of adding on to his house and are now talking about just moving the entire family into his house so we can spend every waking and sleeping second as a family. That’s my update. I’ll write more, so I can take fewer meds.